Teammates douse Mitchell Gale (15) after he became the ACU and LSC career passing leader following the 2012 game with Incarnate Word. History tells us Abilene Christian University’s 24-12 victory over the University of the Incarnate Word in San Antonio on Nov. 10, 2012, was the Wildcats’ last game as a Division II football program. History doesn’t know the half of it. ACU’s NCAA classification that night was merely a footnote buried in goose bumps, Gatorade and one final Gale-force win. It was in that otherwise mundane victory that Mitchell Gale (’13) became the all-time leading passer in ACU and Lone Star Conference history with 12,109 yards, passing his immediate predecessor Billy Malone (’10) in both record books. Gale did it with a red sweatband on his leg and a red-headed kid in his heart. He had come to Abilene unheralded in the summer of 2008 from Alva, Oklahoma, a tiny town tucked under the lip of the Sooner State’s northern border with Kansas, open-carrying a rifle of a right arm and just ornery enough to believe he could achieve greatness and help those around him do the same. He took over as the team’s starter in the sixth game of his redshirt freshman year. The heralds began arriving soon after. Gale helped the Wildcats earn a playoff appearance and first-round road victory in 2009, then led the team to its first ever 11-0 regular season in 2010 with an absurd ratio of 38 touchdowns to just three interceptions. Eight more wins and another playoff berth in 2011 – capped by only the second 500-yard passing game in Wildcat history – followed by that record-setting season of 2012. Mitchell Gale (15) and Rex Fleming at the coin toss before the West Alabama game, joined by L.B. Suggs (7) and Mike Wallace (25). But amid the eye-popping statistics and litany of conference and national accolades Gale piled up was a distinction that couldn’t be measured by numbers or trophies. 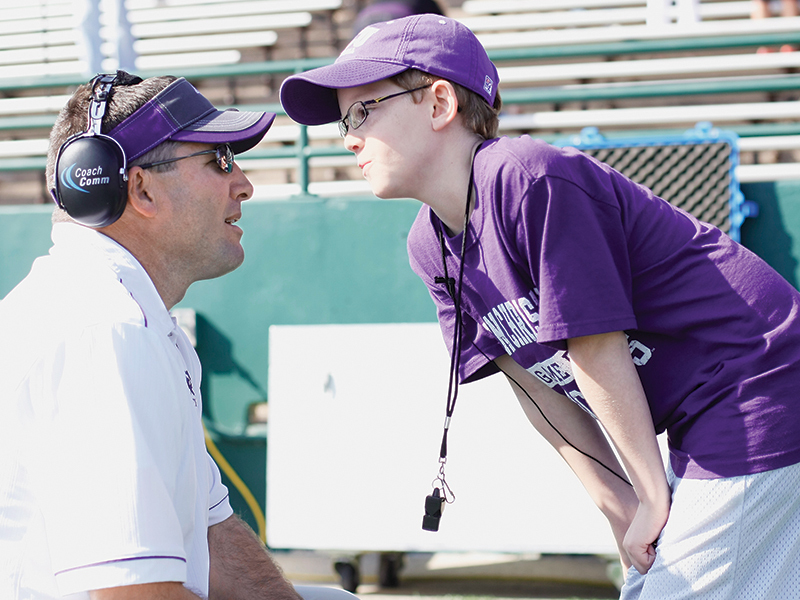 Rex Fleming was the firstborn son of ACU sports information director Lance Fleming (’92) and his wife, Jill. Accompanying his dad to practices and games through the years, Rex became something of an unofficial team mascot. He was old enough to have seen Malone and loved watching Billy the Kid sling it around Shotwell. But Gale was the first quarterback whose career Rex watched from start to finish, and the boy latched on. In November 2010, with Gale and the Wildcats riding the high of that perfect season and preparing for a second-round playoff game, the Flemings were blindsided by the news that a recent series of headaches Rex had experienced wasn’t random but the result of a cancerous brain tumor. Over the next two years as Rex received treatment, his relationship with Gale grew. When he was feeling up to it, he’d show up at practice to call the only play he cared to see (“Go deep”) and give a good-natured jab any time the quarterback erred. When he wasn’t practicing, Gale would visit Rex at home or in the hospital and always kept up to date with the family via text. ACU head coach Ken Collums confers with Rex Fleming on play-calling prior to the 2012 game with the University of West Alabama. As the 2012 season drew to a close, Rex’s cancer had become inoperable and the Flemings encouraged everyone who loved their son to celebrate his remaining days. One of the ways then-head coach Ken Collums and the football team did that was by having him front and center for the final home game, Nov. 3, against the University of West Alabama. Rex gave the team a pregame pep talk in the locker room then joined Gale at midfield for the coin toss (which Rex won) before Collums let him call the first play: what else? Go deep. Gale obliged, finding Taylor Gabriel (’15) over the middle for 33 yards. The Wildcats went overtime to defeat the nationally ranked Tigers, 22-16. The victory clinched a winning season for ACU and left Gale 312 yards away from becoming the top passer in the history of the program and the 80-year-old Lone Star Conference, of which the Wildcats had been a member since 1973. With Rex’s health failing, the Flemings stayed back in Abilene while the team took off for San Antonio to play Incarnate Word. Before they took the field on that Saturday night, Collums gave the team red sweatbands to wear around their legs. 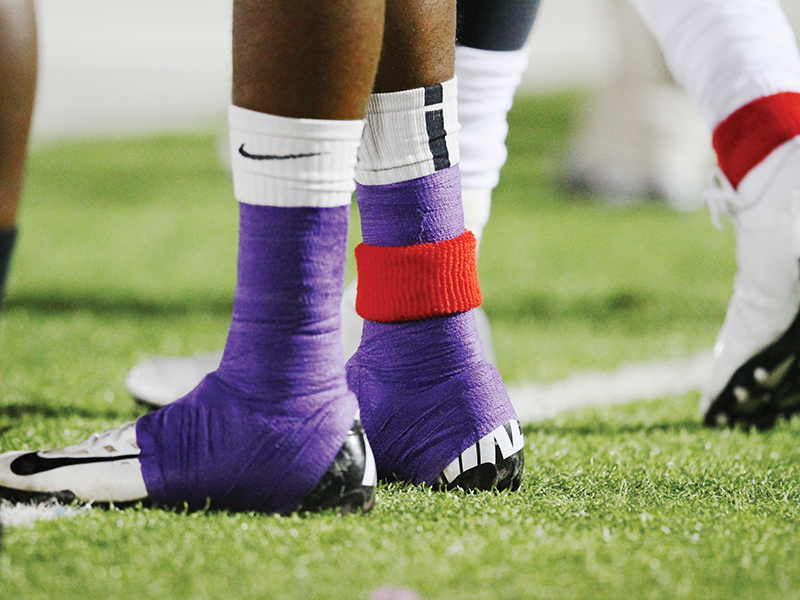 Each ACU player wore a red sweatband around an ankle during the 2012 game with Incarnate Word. In the third quarter, with ACU ahead 17-9, Gale hit wide receiver DeMarcus Thompson (’16) on a curl route that went for 28 yards and moved him ahead of Malone and every other quarterback in ACU and Lone Star Conference history. Gale threw two touchdown passes that night, the 96th and 97th of his career – a total second only to Malone. The last of them, fittingly, an 80-yard strike to Darian Hogg (’16) and a “Go Deep” homage to Rex’s favorite play call. When the game ended, Gale was showered with Gatorade by teammates and praise by UIW head coach Larry Kennan, a former NFL assistant, to commemorate his accomplishments. Still soaking in the moment and the thirst quencher when he got to the press box for a postgame interview, Gale uttered some incarnate words of his own about the Flemings who were listening to the broadcast. Surrounded by his family, Rex Fleming died at his home two weeks later. It’s been nearly five years, but his memory and legacy still go deep into the heart of ACU Athletics and the quarterback whose image is one of those now emblazoned on the facade of Wildcat Stadium. That image, like Gale’s relationship with Rex, appears larger than life. In Rex’s memory, the Flemings established the P4X Foundation to assist other families whose children are battling cancer. The acronym P4X began as a rallying cry to “pray for Rex” and became “play for Rex” when the foundation was created. September is Childhood Cancer Awareness Month. To learn more about the P4X Foundation or make a donation, go to p4xfoundation.com.